I didn't do a post for my Project 365 last week so I'm catching up. The beautiful flowers Luke sent to me at work. I love Valentine's day. After work we went to eat at my favorite restaurant. I sat and read almost this whole book in one sitting on Tuesday night. It was ok. There were parts that made me laugh out loud. It was a quick, very easy read, but not the best book. Kinda gross. I tried these girl scout cookies for the first time on this day. They might be my new favorite. One of my goals for 2011 was to try a new recipe every week. Thursday I tried this recipe. It was very yummy. I haven't had a ton of energy lately and most Friday nights I feel like staying home and just relaxing. So this Friday we got some pizza and enjoyed the night in. This was the day of my baby shower thrown by some wonderful women from my office. This picture cracks me up because it shows just how big I've gotten. We played this "guess how big the belly is" game at my first shower and my growth between that shower and this shower is insane. It takes hard work (and good food) to grow a human! Sunday was my friend Jodi's shower. Here we are in front of her food table. I'm anxious to see who has their baby first (we are 5 days apart). It would be fun if we had them on the same day! 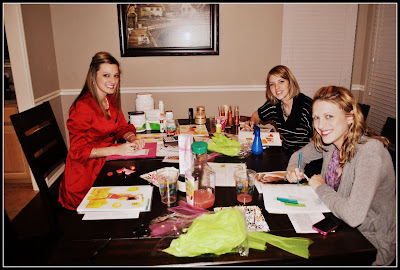 I had some girls over for an Arbonne party on Monday night. It was a fun girl's night. No picture on this day but I finally got a car! Woo hoo! Luke and I shared a car for a month and really it wasn't that bad, but it's nice to have my own car again. I feel like such an adult! No picture Thursday or Friday. 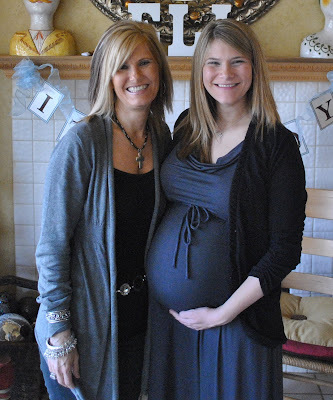 The day of my last baby shower for Eli. This one was put together by our church and was so wonderful. They did a book theme and the cake was a scene from the Hungry Caterpillar book. It was SO pretty (and delicious). How Far Along: 37 Weeks!!! Holy cow! Luke said this picture makes my face look more puffy than it really is. So please keep in mind when viewing. Total Weight Gain/Loss: Ha! This is comical at this point and not something I will share. Yes I'm vain. No I don't care. 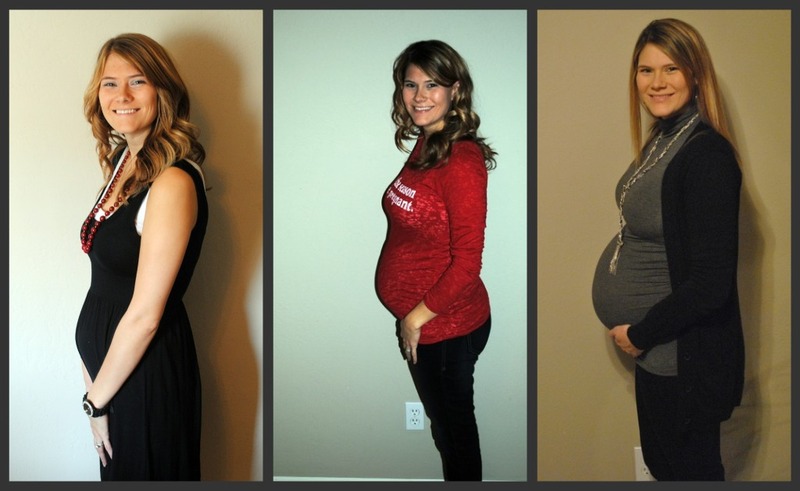 Maternity Clothes: Everything about me is maternity. Movement: Still moving around quite a bit, but lately it hasn't been great big movements. I think maybe he is running out of room. Sleep: I get up several times throughout the night to use the restroom. So I'm not getting too much sleep. 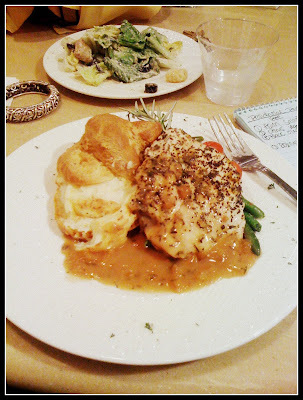 What I miss: A good night's rest and being able to eat food without worrying about whats in it. Cravings: Lately I have wanted tea a lot, which is weird because I've never been a big tea person. Symptoms: Heartburn, holy mother or pearl the HEARTBURN is horrible. Best Moment this week: Another awesome shower, getting the nursery put together and all the clothes and blankets washed, and hearing Eil's heartbeat on Monday. "Wow, you've almost caught up to me"
Good. That was my goal. I forgot to do my 36 week update last week and I even forgot to take a picture! I don't think I was overly busy, it just slipped my mind. I'm telling you, pregnancy brain is a real and true thing! I had no idea! I told Luke today that I feel like I live in a constant state of confusion right now, I'm always confused about something! I have several posts in mind, we will see if my confused state of mind ever gets around to posting them! 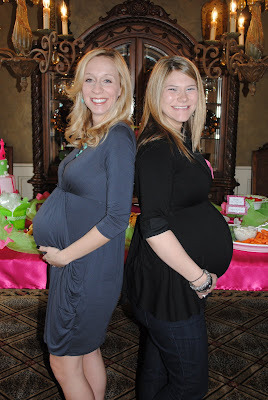 This was the weekend of baby showers! First of all on Saturday morning a wonderful group of women from my office hosted a shower for me and Eli. I was so excited about this shower and it was an amazing shower. They thought of every detail. In front of those cupcakes are pickled Pringles, mustard and cheez its. 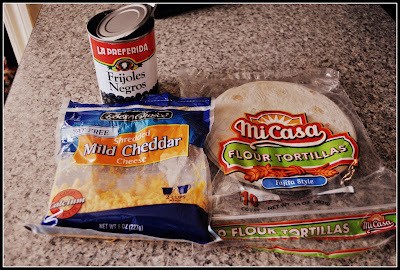 Some things I have eaten at work during pregnancy. I LOVE to dip the pickled Pringles in mustard. YUM. I have seen different diaper cakes but I had never seen anything like this, it was incredible. This is a motorcycle built out of diapers, burp rags, receiving blankets, bottles, bibs, teething rings, and a basket thingy to go in the dishwasher. It was seriously so amazing. I was so proud of my friend Melody for making this. I don't think I ever could! 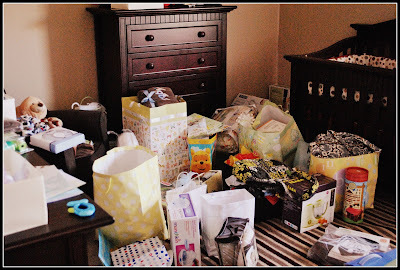 Once again we are so thankful for the baby shower's that people have taken the time to put together for us. And for everybody that has gifted us. Eli has no idea how many people already love him! After the shower my mom and I tackeled Eli's room. We got EVERYTHING washed. All clothes, sheets, blankets, etc, etc. We hung up decorations, got the closet organized and just cleaned up the room. I am SO happy that my mom was here to help me do it. We worked hard on it until around 11:00 that night. You can actually walk in his room. Yay! Sunday afternoon I helped host a shower for my friend Jodi who is due 5 days after me. I've said it before but it really has been so fun being pregnant together. We discuss a lot of TMI pregnancy subjects that would gross other people out, share our cravings, talk about how THIS TIME NEXT YEAR WE WILL HAVE A -insert appropriate age here- BABY and so on. I can't wait to experience motherhood with her. Her shower was wonderful and she opened presents for almost 2 straight hours! Lots of cute little baby girl stuff. LOTS of pink! It was a fun, productive weekend! 1. I just realized I never took a pregnancy belly picture this week. It never even crossed my mind. I am slowly but surely losing my mind. I will try and take a pic tomorrow. 2. I have been working on a post all week about something that God is teaching me. But the words just aren't formulating. I'm thinking that means God is still teaching me about this particular issue. I'm still open to learning but ready for the LESSON TO BE LEARNED. 3. Luke and I are still sharing one car. We have been doing this for one month now. I have complained off and on about this, but really it isn't that horrible. The worst part is waiting for Luke to pick me up after work everyday. I just look at it as we are getting lots of quality alone time together before Eli gets here! Even if he thinks I talk a lot while in the car. 4. I'm getting my hair done tomorrow and I can't decide if I want to go darker or lighter. Always a dilemma. 5. I saw newborn pics of a baby named Eli today and I got incredibly excited. I cannot wait for our sweet baby to be here. And I'm just assuming he is going to be sweet. My mom tells me all the time that she hopes I get an easy baby. ME TOO MOTHER. I think if I keep calling him sweet that means he will be sweet. And a good sleeper. 6. Every time I watch episodes of Desperate Housewives or Grey's Anatomy I get sad about how good it once was. What happened?!? They both went downhill. 7. The weather this week has been so beautiful. I've been wearing short sleeve shirts with a light cardigan and flats. Very spring like. I just heard on the news that we have a cold front coming again next week. I loved the snow last week, but I loved the warm weather this week and want it to stay that way! 8. I really need to finish Eli's nursery. I also need to clean my house. You don't even want to know how long it's been since I've cleaned. I just move much slower these days and by the time I've finished cleaning one room I'm done with that nonsense. 9. I make my bed every single morning. No matter how messy my house is, or how many clothes are on my floor if my bed is made I feel like everything is put together. 10. I am so glad that I get to watch Oprah on my maternity leave before she quits (retires?) I get her for about 2 1/2 months before her show is gone forever. I'm so happy. This morning when getting dressed I could not figure out if I wanted to wear a pink or red scarf in honor of Valentine's day. I asked Luke's opinion and he was no help at all. Apparently he does not understand the art of coordinating outfits with the holidays. I eventually decided on the pink scarf and we headed out the door to begin our day. Yes, we are still sharing one car. It is a barrel of fun. Can you sense the sarcasm in that statement? I've been asking God to please teach me what it is he needs me to learn during this time because SISTER NEEDS A CAR. Please and thank you. Anyways, today is Valentine's Day and I might be in the minority, actually I'm sure I'm in the minority but I LOVE this day. And for the record I've always loved Valentine's day. From the time I was single to the days when I had a boyfriend all the way up to the days when I was sure that same boyfriend was never going to propose, then when he finally did propose I loved valentine's day during the newlywed days and now I love it today with my baby-daddy. I just love this day. I think it is such a sweet and fun day and a great day to spread the love. And by love I of course mean chocolate and various forms of candy. 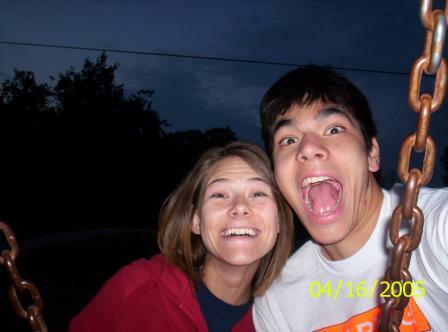 Even though I love this day very much we never go all crazy. We usually keep all birthdays, anniversaries, and valentine's days pretty simple and low key. And due to the fact that baby boy is coming next month we decided to keep it really low key this year to save a little of that green mulah. So after work we went to my very favorite restaurant. When we got there the boy behind the hostess stand informed me that our wait would be 105 minutes. To which I said "105 MINUTES, WHAT DOES THAT EVEN MEAN?!?!" I really said that, and he laughed and explained that it was an hour and 30 minutes. Which Luke later informed me it was not an hour and 30 minutes and the kid couldn't do math. I do think it's funny that the boy laughed at me when I yelled at him. You can kind of do whatever you want when you're pregnant and people will excuse you because your pregnant. Including putting a lamp shade on your head in a public restroom. So after waiting for what seemed like a good forever we finally sat down and enjoyed a little Valentine's dinner. We talked about many things, but mainly about how much our life is about to change, for the better. 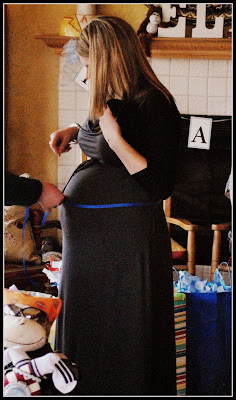 It seems like all conversations these days somehow end up going back to little Eli and how excited we are to meet him. Everyday I am so thankful for my husband. I'm not typically a person who shares my emotions publicly. I mean sure, I'll give you the visual of me squatting over a toilet but I clam up when it comes to talking about how much I love my husband. I'm just interesting that way. I'm not sure why God chose to bless me with Luke as my husband. But he did and I am thankful. We are two very, very different human beings, but somehow, we fit together perfectly. 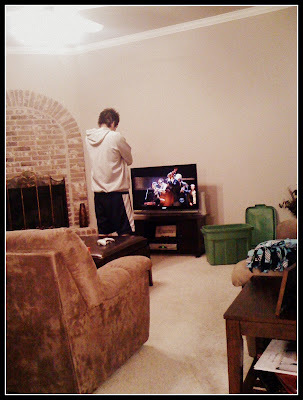 He encourages me, laughs with me, laughs at me, gets mad when I sit on my computer when we are watching TV together, cooks for me, prays for me, leaves his dishes out for me to put in the dishwasher, reads to me when I ask him to, sings to me, sings too loudly to annoy me, provides a listening ear when I need to vent, guides me when I worry, plays card games with me even though he hates them, watches Real Housewives with me, searches the house for my Tum's at 1:00 in the morning when heartburn is in full attack, and just loves me for who I am. Including dating we have been together for almost 8 years, and this year we will be adding our son to our family. I still don't think I have completely wrapped my mind around the fact taht we will soon have a child. It is so crazy to me. And even though I totally joke about Eli inheriting Luke's crazy hair, I am so hoping that Eli looks just like Luke. A cute little Indian baby boy! So happy valentine's day to my sweet husband, you are my very favorite husband ever. 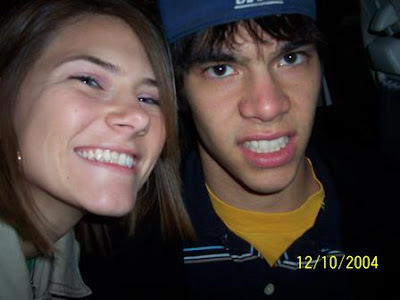 Basically those pictures are just proof that we've always been a little weird and nerdy. Two times a year there is this HUGE craft fair that comes to our area. In case you don't know, I have to tell you, craft shows rock my world. I'm not sure if it's because I grew up going to them, or because I do not have a creative bone in my body so I gladly pay other people to be creative for me or if I just like to people-watch at said craft shows, but whatever the reason is I love love love them. I know when this craft show comes every year and I somewhat save some money to prepare for he big day. I say somewhat because saving money has never been my fortay. That's why I married Luke, he is an excellent saver. Anyways... after church a friend picked me up (I'm so pathetic without a car, I need a car ASAP) and we headed down to the craft show. It was 5 buildings of goodness. Purse crafty goodness. And I had one goal in mind to find the finishing-touches pieces for Eli's room. 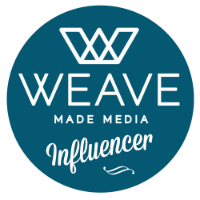 I feel like I was moderately successful in this venture. I found some decorations to go in his nursery (is it called decorations if it's for a boy?) and I love them all. But I still feel like I need a couple of key pieces before the nursery is complete. So for now, the nursery is still a work in progress. After several hours of shopping my friend had to leave and I had arranged for Luke to pick me up. So I had a bit of down time by myself in the time period between my friend leaving and Luke picking me up. Seriously, when did I backtrack to the age of 15? At least I own a straighter in this era of being a 15 year old again. Straighter, then car. Priorities people. OK back to the craft show. Naturally it was during the time that I as alone that I realized I needed to find a restroom pronto. Baby boy was on my bladder and it was not fun. I tried to walk (waddle) around and not think about using the restroom but it was inevitable. I needed to find a bathroom quick. So here I am, big and pregnant Megan with a heavy bag in one hand that has a plank of wood sticking out of it (for nursery, pictures coming sometime in the next 6 months) and I'm carrying a lampshade in the other hand and I've also got my purse to deal with. And I was NOT about to set any of that stuff on the nasty, sticky, wet-in-some-areas bathroom floor. Because we all know the wet areas on the bathroom floor are not wet from water. Use your imagination. So I did what any normal person would do. I thought back, deep in my mind to an Oprah episode I saw at one point in the 25 years she has been on TV. And I clearly remember her once telling me to never put my purse on the bathroom floor but instead hang it around my neck. Then I took the heavy bag with the wood plank (and various other purchases) and balanced it between my calves. Then I took the lamp shade, that was wrapped in a trash bag and balanced it on my head. And then I proceeded to squat over that nasty toilet. Which mind you, squatting is VERY hard for me on a good day. And a good day means without a lampshade on my head, a bag balanced between my calves, a purse hanging from my neck and gigantic belly weighing me down. But alas I did it. And I felt so victorious. Then I went to wash my hands. And realized I was facing the same challenge. Well minus the squatting part, thankfully. So I once again balanced the bag between my calves and put the lamp shade on my head. And then washed my hands. All in front of a long line of women. I definitely heard some women snicker. However, I do feel honored that nobody offered to help. Obviously they thought I looked like I was in full control. Clearly, they had no idea that the lampshade was teetering on my head and a mere seconds from crashing to the ground. Or maybe they did and that's why they were snickering? Regardless, I am woman, hear my roar. I'm sure, in some way this little situation is preparing me for motherhood and everything that I am going to have to balance. And it's always good to know you can balance a lampshade on your head while squatting over a toilet. You know just in case of an emergency or something. 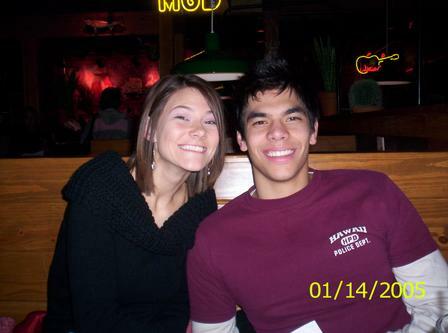 This was Luke's 27th birthday! Currently I am working on winning the worst wife award. I did not have a gift or card or cake or ANYTHING for him on his birthday. I had ordered him something off the internet but it hadn't come in yet. And I did make him a card out of markers and construction paper which he loved. Not sure if he loved the actual card or just the fact that it cost $0.00. Also Monday, Luke's birthday, was the day of my horrible Dr appt where I found out I am gone above and beyond what I was supposed to in the weight department. So I wasn't a happy camper the rest of the night. 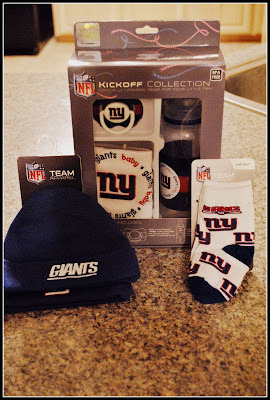 Anyways, when we got home for the night there was a package on the door and it was some NY Giants apparel that Luke had ordered for Eli. Clearly he is ecstatic to have a boy in the family to pass down his NY Giant love to. 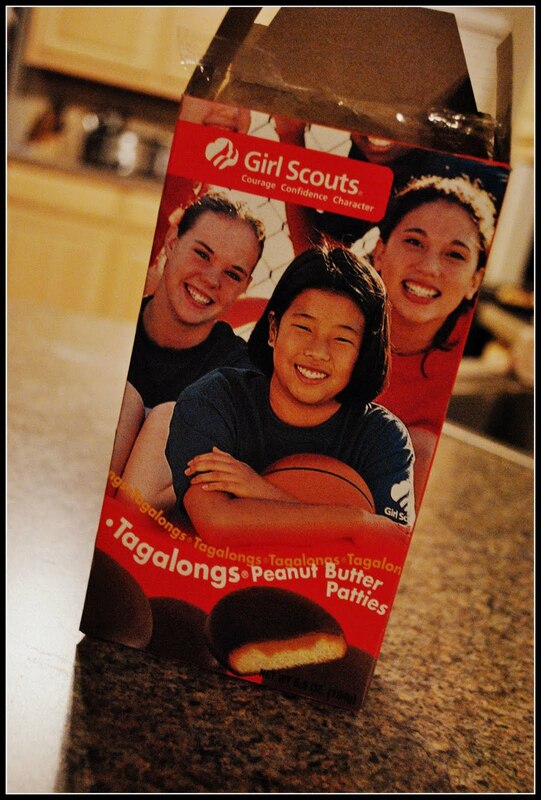 Our girl scout cookies came in on Tuesday and I had mixed feelings about this. However it did not stop me from partaking in some yummy Tagalongs. My favorite cookie! We woke up to more snow on this day! I absolutely love all the snow we are getting! We spent the day in our PJ's catching up on various tasks around the house. It was a wonderful, relaxing day. Thursday we were back to work, well the campus I work at didn't open until 11:00. So that afternoon we were back to work! When we got home that night I had a package on my door from Scentsy. It was all the new scents and new catalogs. I was SO excited. 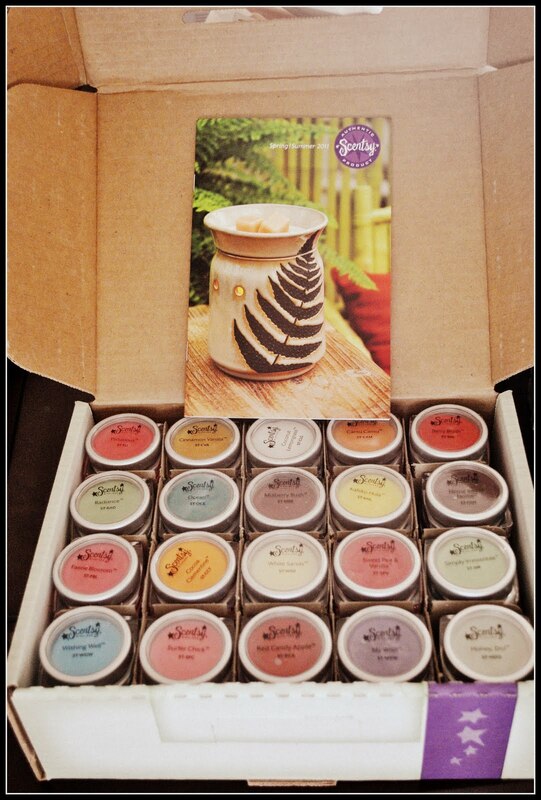 I spent the rest of the night smelling the new scents and flipping through the catalog. I'm excited for Spring/Summer 2011. On Wednesday I spent most of the day washing Eli's clothes and putting them in piles. 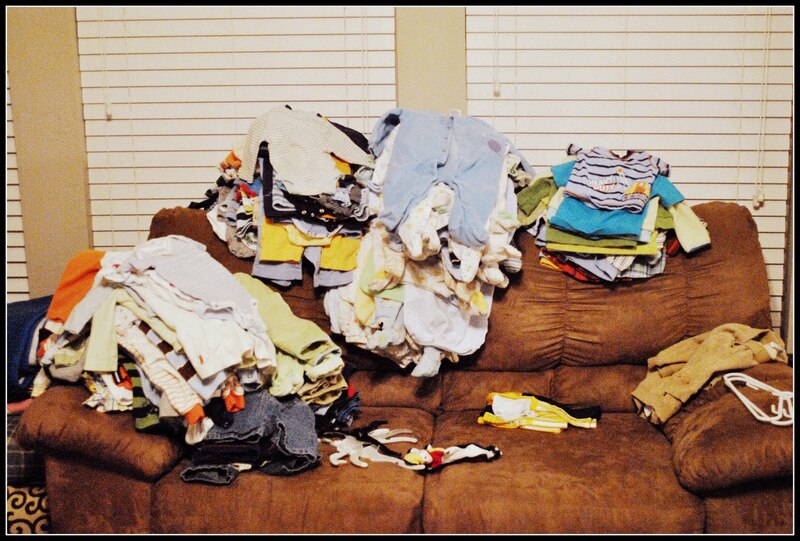 By the end of the day I didn't know what my piles were, they were just random piles all over the sofa. By Friday they were still sitting there. I eventually had to just throw them all in his crib until I go buy some hangers.Friday night we just hung out at home with a frozen pizza and netflix. It was a good night. This was another low-key day. We woke up, took our time getting ready, ate lunch at Chick-fila, ran some errands, I went to a baby shower, and then we went to Luke's soccer game. That night we made black bean and cheese burritos. I'm realizing we had a very low-key week. Total Weight Gain/Loss: I've debated whether to share this or not. I've decided not to. Maybe I will at the end. However at this rate that's a big fat no. 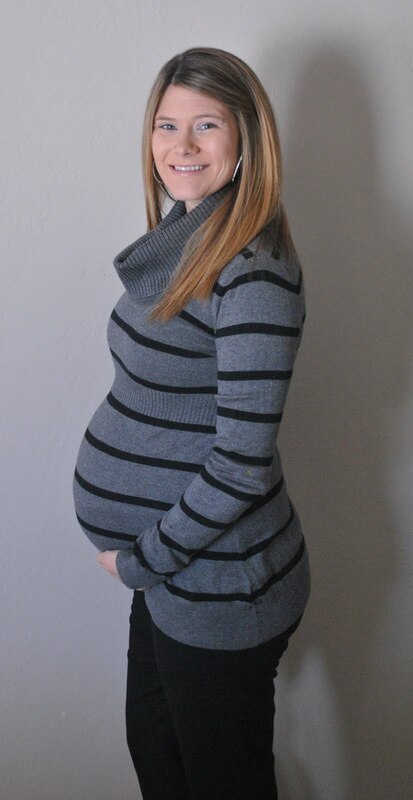 Maternity Clothes: Everything about me is maternity. I even went in search for maternity underwear. If they made maternity socks I would probably need those also. Movement: Oh yeah, baby boy moves a lot. I love watching my belly move. It is so much fun! This morning it looked and felt like he was playing the drums in there. Maybe he will take after his daddio and be a musician. Of course Luke doesn't care if he is a musician or not - as long as he plays football. Sleep: Sleep is pretty bad. Luke asked me why and I can't pinpoint it. I just can't get comfortable. I think it's a combination of sleeping on my side combined with getting up multiple times to go to the bathroom that has made sleep so bad. It has gotten better this week so I'm very glad about that. Symptoms: The bad sleep thing, heartburn and I get worn out really easily. Very tired. Best Moment this week: We got to hear the heartbeat this week and it was good and strong! Also, we had a teeny tiny ultrasound this week and the Dr confirmed that the baby is head down. However that was all we saw. Our dr treats ultrasounds like PURE GOLD. "The only thing I haven't liked about this pregnancy is that black line down your stomach. What is that and will it go away?" I do have a dark line on my stomach but it really isn't that dark. Luke is just a little sensitive about it. I'm not sure if it will go away or not. Also, during the snowcation I played around and made collages of weeks during my pregnancy. It is so amazing to see how much I've grown (and how much I'm still growing). I showed this to Luke and we were laughing about how big we thought I looked in my 14 week picture at the time. I can't believe I am already 35 weeks! This pregnancy really has flown by! We still have two more shower's left and several "necessity" items to get but we are pretty ready for little Eli to be here. Most days it feels like he should already be here! Today we woke up to MORE SNOW! At this point I wasn't even surprised. The weathermen accurately predicted the storm last week and so I figured they would be correct in their predictions for the storm this week. So Luke and I spent another snow day at home. I have to admit it wasn't as fun as last week's snow storm. I'm not sure why that is. Maybe because at this point a snow day is just old hat? Or possibly because I made the megan-has-gained-too-much-weight decision and opted not to get an Coke while at the grocery store so then I was stuck indoors with only water. The HORROR. As soon as we left the grocery store last night I knew my decision to not get my precious Coke had been the wrong one. However I knew that according to the scale it was actually the right decision. I turned down many offers by Luke to stop at various convenience stores along the way home to get me some Coke. I felt so pathetic, surely I could go a day without that poison. And I am proud to say that I have. It wasn't without pain, tears and whining, but it did indeed happen. I also wasn't as productive on this snow day as I was on the 3 snow days last week. Last week I kicked some major To-Do-List booty. Today, not so much. Luke spent the day looking at cars on the internet (we are still a one car family for the time being) and I spent the day looking around at everything that needed to be done and then avoiding it. Avoidance is one of my spiritual gifts. I wish I had a picture to show of all the snow we got, or even a pretty picture of the snow falling from the sky, but I wasn't about to go outside. The windchill was somewhere around 10 below zero. No. Thank. You. We finished up the day by enjoying a roast with potatoes and carrots that Luke had put in the crock pot this morning. And also watching American Idol. I am really loving it this season. I was nervous about Steven Tyler and JLo but I love them. 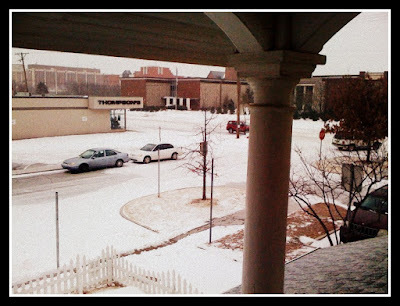 So this is the story of how we spent our second Oklahoma Blizzard of 2011. Call me crazy but I could handle another blizzard. I'm really not sure if I remember what it's like to work a full week! There have been several times during pregnancy that I have come on here to share my heart, but ultimately back out for fear of looking ungrateful or like a complainer during this season of my life. That is the last thing I am or want to look like. I am very grateful that God chose to bless us with this baby and I am so thankful that I have had an easy pregnancy and for the most part I have really enjoyed being pregnant and once this baby comes I will miss feeling his sweet little kicks and movements inside of me. However, take the crazy ups and downs of hormones, and combine it with all the changes that are taking place during this time and add a person who doesn't do very well with change in general, and it is safe to say that there are moments when this process has been hard. I am ashamed to admit that one area that has been hard for me during this time is the whole weight gain part of it. Before I was pregnant I would get so annoyed with women who would complain about gaining weight while pregnant. I didn't understand it. I mean OF COURSE you are going to gain weight, is what I would think. You have a HUMAN BEING growing inside of you, along with placenta and some other nasty stuff. Weight gain is natural and expected. Get over it (you big baby). Those were my thoughts. I won't elaborate on it, because I still feel selfish and so vain discussing it. And, obviously I'm gaining weight for a good reason, but it is still hard to watch your body change and the numbers continue to escalate. Aside from the emotions of dealing with weight gain there is the added stress of trying to figure out child care, trying to figure out how to balance finances with the new added expenses, plus lack of sleep, various pains and discomforts that come from normal pregnancy and some hormones that are a bit out of whack for the moment and it can be disastrous at times. There have been moments during this pregnancy that I have completely snapped or burst into tears with no rhyme or reason about it. And since I'm being honest, I will say that in the past I have always felt like some pregnant women used their hormones as an excuse to act how they want. I still do think that some women do that, BUT now that I have been apart of this pregnancy experience I can honestly say that there are times where I am a victim to my own hormones. Sometimes while sitting still I will feel this sweet baby move and I will just burst into tears. It is so amazing to me that he is moving inside of me. My baby! It just baffles me. Then there are other times that I will burst into tears because Luke doesn't want to eat at the same restaraunt I want to eat at. Fun times. I don't say all of this to make pregnancy sound unpleasant, because it is far from it. We are so overcome with excitement thinking about our new addition that is on the way. We've had so much fun getting ready for him, in all ways, mentally, physically and spiritually. But, as exciting as it is, it is also an overwhelming time. So many decisions to be made and scenarios to figure out. I have learned a lot during this time about trusting God, letting go of worries, not letting things consume me, etc. I am still learning, and many times I have to consciously make an effort to shut off my mind and hand it over to God. I can only imagine that I'm about to learn a whole lot more once Eli is here! So that is the wide range of emotions I'm going through right now. From pure elation, to worry, to fear, to irritated (with my weight) all the way to extreme excitement. I'm sure its a fun time for Luke, he never knows which of the above emotions he is about to come into contact with. It keeps him on his toes. I hope that those reading can accurately see my heart and know that I am not ungrateful for this time. And also that this is just one pregnant girl's thoughts at this time. 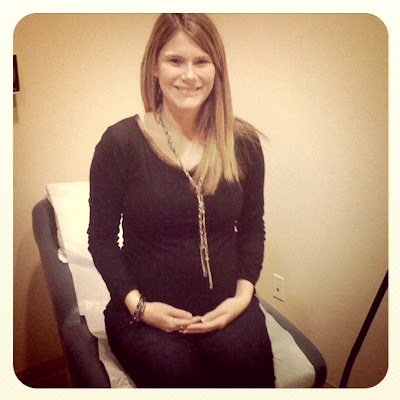 My emotions and feelings do not dictate how pregnancy is for each and every person. Everybody is different. In fact if I take away one life lesson from this whole process it will probably be just that. Everybody is different. Apparently it took me getting pregnant to figure that out. This is what Eli's room looked like the day after my last shower. Plus there was move on the other side of this camera. Every time we get it all cleared out and put away we bring home more stuff. So thankful for everybody who has gifted us during this time! 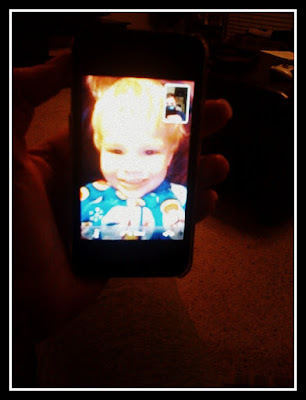 I love talking to my family on Face Time on the iphone. On Monday night I talked to my family while we were both anxiously awaiting the snow that was headed our way. This sweet guy had his jammies on ready for bed. The snow came just as expected! And we could not go anywhere. 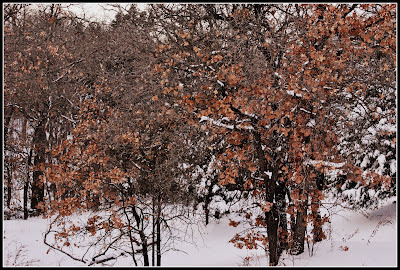 Here are some tree's in our backyard. 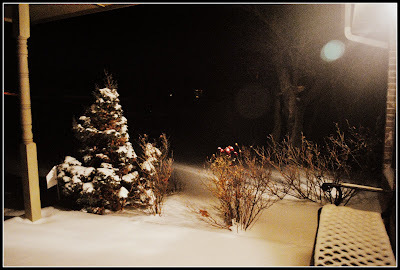 This does not at all show how much snow we got but I love this picture that Luke took. Luke and I went outside and snapped some pics of my preggo belly in the snow. The whole time we were trapped inside Luke kept talking about how he wished Eli was here already. We are very ready for that little guy! I love that I was very productive during my 3 snow days at home. My snowcation. 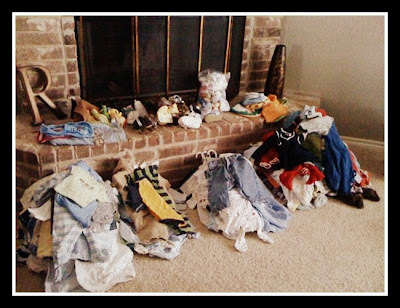 On Thursday I organized all the clothes my sister gave me that were my nephew's clothes. These are all of Eli's clothes up to 6 months. Now they just need to be put away! Luke and I both went back to work on Friday. As soon as we got to our offices the snow started falling, hard! It snowed the rest of the day. Call me crazy but I'm loving all this snow! It doesn't do it all year, it will get warm again soon, I'm just enjoying it while its here! Luke and I woke up Saturday and headed out to go car shopping. We hate car shopping. Hate. It. Luke is so money smart is kinda drives me crazy. I understand him wanting to do the right money thing, but I just want a car. And I know the whole process is frustrating for Luke as he spends most of his free time looking for a car. So we are both learning patience. Anyways after we got home we ordered pizza. 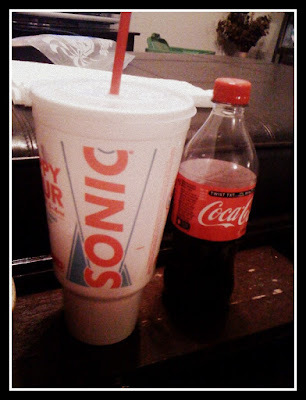 And I enjoyed my favorite drinks, a Route 44 water and coke. Yes I drink coke and caffeine while pregnant. No I will not touch deli meat. Everybody is different. Getting Route 44 waters has become my favorite thing. And they are only 50 cents at some places and 80 cents at others. Not sure why they are different. This weekend the meteorologists were predicting a giant snow/ice storm headed our way. Many people were skeptical but I have come to have full faith in the weathermen. It seems as technology advances they are correct way more times than they are wrong. I will admit I was once a weatherman skeptic, but now I trust them fully. So just as predicted Monday night the snow started coming down hard. By Tuesday morning we were completely snowed in. And I started to panic. I've never before panicked during as now storm. In fact most times I enjoy it, however I've never been pregnant during a snow storm. Tuesday morning when I realized we could not get out of the house, I started freaking out that I was going into labor. I fully convinced myself that I was having labor symptoms. Minus the whole water breaking thing. I consulted a friend and she thought maybe I was just overreacting. Just maybe. I think this must be what claustrophobia feels like. After I decided I was in fact not in labor I enjoyed the rest of the day and was very productive. I was so proud of myself for how productive I was considering a move at a snail's pace. Maybe slower than a snail's pace, a baby snail's pace. Or an elderly snail's pace. Around 1:30 I got a text that campus would be closed again on Wednesday so I toned down the productiveness a bit because I knew I had another day. All things were calm until around 9:00 when the power started flickering. However I don't think flickering adequately describes what it was doing. It was going on and off for about 2 hours and would stay off for a good 30 seconds to a minute each time and then come on. It was SO weird and SO annoying. Also I've mentioned before that I'm scared of the dark, but I guess Luke always thought I was joking. He was honestly shocked at how scared I was to think we might be stuck in our house in the dark all night. Poor Luke was snowed in with me when I had two major freak out's in one day. Oh well, he's the one that married me! I really had a meltdown and I might have gotten in the fetal position on the floor. And it wasn't just because I was missing the Real Housewives reunion. That was only part of the reason. The other part was because of the dark. Eek. I started running around the house trying to find various devices that would produce light but did not require power. 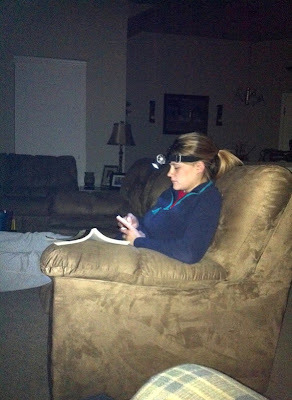 We don't have any candles in our house (long story) and only have one flashlight, but I was saved when I remembered I had this head lamp. Thank you mom for getting this for Luke for Christmas. I have no idea what your reasoning for getting it for him was but it SAVED ME during Snowmagedden 2011! Luke was much too amused by me wearing this head lamp. I didn't care. I need LIGHT. Finally after the power had officially been out for around two hours it came back on. I then sang the Doxology (praise God from whom all blessings flow......). Today (Wednesday) I've been productive once again and then found out around 5:00 that the campus I work at will be closed again tomorrow! I plan to be REALLY productive again tomorrow. I'm loving this days to help me get ready for baby Tree. Also, sometime in the afternoon I had the grand idea of taking my weekly pregnancy pic outside in the snow. This resulted in more weekly fights than normal. And apparently I'm the bossiest person Luke has ever met. Rude. But here I am at 34 weeks today. 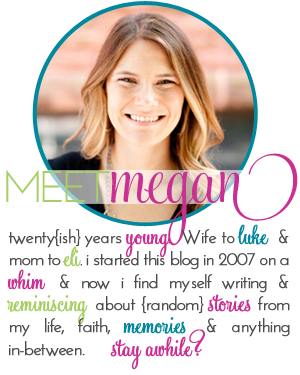 I've totally messed up my weeks on the blog because I did them the week before. So I don't have a 33 week update. I am getting VERY round. I mean obviously I've been round for awhile, but in just the past couple of days I have really rounded out. So that is how we have spent the past couple of snow days. Minus a couple of meltdowns and fights over picture taking, it has been a great couple of days! I started a new bible study at my church today. It is Kay Arthur study and is my second one of hers to do. I loved the last one and I am absolutely loving this one. I've never been a big "studier" of the old testament and have felt convicted about it many times. So digging into God's word in the old testament has really opened my eyes. I can't wait to see what this study reveals. Monday afternoon I had my bi-weekly Dr appointment. This is where I sit every other week. After dinner we went to eat at Outback with Luke's mom who was in town for meetings. This is the last picture of my car ever. My wrecker came to pick up my car and I totally teared up as he drove it off. I've been through a lot with that car. My parents flew to Atlanta and drove it back for me in 2007, it was with me when I was single waiting on a certain boy to propose. It traveled back and forth with me as I was planning a long distance wedding. It's just been through so much. I will miss her (him?). I really don't have a picture from this day, so I'm using this picture that we took last week because this is what I do a lot of days. This is the glider in Eli's room and I go sit in it and just look at his room and imagine what it will be like when he is there (plus the glider is super comfortable). I cannot believe that I will soon be rocking my baby in that chair. I love spending time in his room! 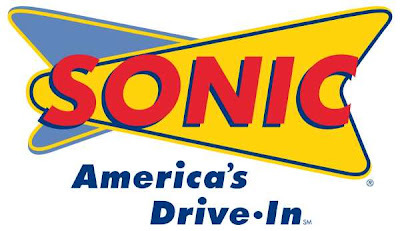 Again, no picture, so I included this picture of Sonic's logo. People, I had Sonic 5 times this week. That is sick and disgusting. My poor baby. I have also gotten in the habit of getting a route 44 water every single day. They are only 50 cents and then I refill the cup all throughout the day. I find I drink a lot more water this way. No picture again. I was bad this week. But Friday was crazy. I was running around all day and never stopped until we got in the car to meet my mom halfway between our house and my parent's house. Then I spent the rest of the night writing thank you notes and talking to my mom. This was the day of my shower. After the shower I went back to my parent's house and hung out there the rest of the day. It was absolutely BEAUTIFUL. 77 degrees, sunny, and just so pretty. 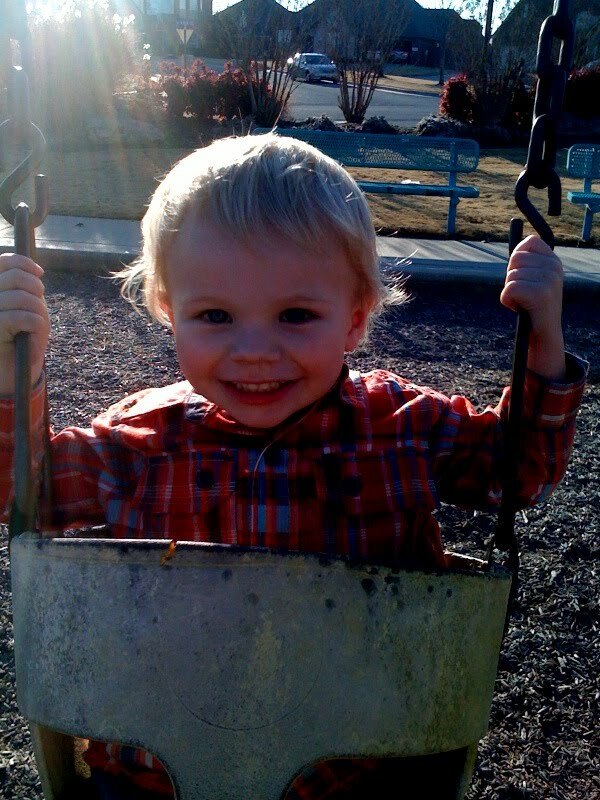 So my mom and I walked my nephew to the park. He was loving the weather!